This small High-resolution camera is waterproof and excellent for little or no light areas. 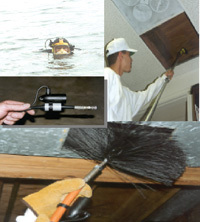 Switching to infrared will illuminate total darkness making it easy for user to inspect. The 7″ monitor is a High-Res. computer and has video recording capability. 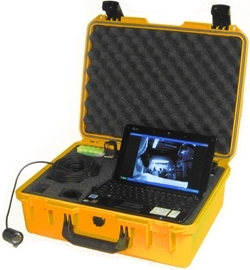 The entire system is enclosed in a durable, lightweight and watertight case.